I had a Moment with my kids last night. I hope you have had one of those with your kids lately, because it is really something. Do you know what I mean by Moment? I mean heart full, grateful to be really sharing something with your kids, everyone is not just maintaining but stable and happy, and did I mention heart really full Moment. I took all three of my munchkins to see Video Games Live at a local outdoor venue on Saturday. 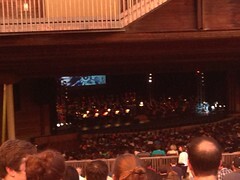 This show featured the National Symphony Orchestra playing songs from video games, accompanied by vocalists, a choir, and a big screen showing scenes from the games. It seemed like the right show to introduce my kids to how to be an audience for an orchestra, especially considering I could buy lawn tickets at a venue that lets you bring your own food and drinks in. Still, I was worried when I bought the tickets a couple of weeks before showtime. I felt as if I were gambling that hundred dollars on a flimsy bet. As the ticket date approached, I thought more about the logistics of the concert, and thunderstorms began to be predicted, that worry began escalating into panic. I know that going to an outdoor concert with your kids might not feel like such a big deal, but there were so many things that could have gone wrong. I was worried it would be too loud or too crowded or just too plain stimulating for my kids with their sensory sensitivities. Because Alex couldn’t go with me, I was worried about keeping all three of my kids together and safe in case of something as mundane as having to go to the restroom. I wondered what I would do if someone needed a break and had to walk around but the others didn’t. I was worried that I might turn my back on him for a second and Jack would slip away in the crowd, as he has done before. I was worried that one or two of them would be bored and I would have to make a decision about leaving early. That all said, I am grateful that is within my family’s abilities to try at all. And try we did. And it didn’t rain. And my kids loved the show. And there were some small frustrations and we handled them. And, like I said, it was A Moment. It wasn’t a Moment at first. We got there 45 minutes before the show, which, it turns out, is not early enough to secure a good place on the lawn. It would really have helped me out if all of these people had been a little less on the ball. We managed to squeeze into a spot where we would be able to see the screen, but it wasn’t ideal. It was, however, an ideal place to eat a very tiny amount of the chicken I brought, but huge amounts of the chips and cookies in my possession. This is the trick behind a great many of my successful outings: cookies. We ate soooooo many cookies. 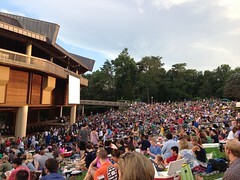 The second problem we ran into was that when the show started, it was not quite dark, which meant that you couldn’t see anything on the screen on the lawn—and our seats were too far back to be able to see the screen behind the orchestra. It looks AWESOME in there. What’s happening on that screen? Quinn started to get stressed out and complain that he couldn’t see the screen. This worried me because with Quinn, when you lose him, you lose him. It is really hard to get him back once he’s decided he’s miserable. I told him that it would be dark soon and he’d be able to see the screen and then I told him something that helps me in situations that are Just Not Acceptable. I told him that at events like these that there are often frustrating things that happen and it is okay to be frustrated at them, but you have to try to accept that and keep moving forward. Either he listened to me or he saw something shiny, but either way he held it together, it got darker, the orchestra played, and video games started to flash across the screen. Also, that’s not his wine. Or mine. It didn’t matter to my kids if they knew the video game on the screen or not, they were captivated. It was hard to keep my attention on the show because my eyes kept swinging back to my three guys. They wore smiles like you wouldn’t believe. Watching them gave me that happy feeling in my chest that is so magical. We were sharing something that they loved and they were seeing it in a new way and it was wonderful. There was an intermission in the show, which gave me pause, but even that went smoothly. Knowing that waiting for a second half can be tough, I preempted any angst by thrusting iDevices at the kiddos. Also, my friend Robin, who was in attendance but who had very wisely purchased tickets in the seated section, still came way out to the hinterland to say hi to us. There were a ton of flutes highlighted in the show, which was great, what with Team Stimey’s resident flutist in attendance. I give it a week, tops, before Sam asks me to buy him sheet music for video games. Even during things that upset my kids (Quinn doesn’t like audience clapping; Jack evidently doesn’t like the music to Donkey Kong Country), they just quietly covered their ears and carried on. When things they did like came up though, well, there was nothing quiet about them. There was one segment where the winner of the pre-show Guitar Hero contest went on stage to play live in an attempt to earn 450,000 points. When he passed the target, Jack’s arms shot up in the air and he screamed, “I LOVE YOU!!!! !” in the hoarsest, most authentically rock concert way possible. It was the best. Jack also shouted, “One more! One more!” before the encore, totally unprompted. It was as if he’d been to many concerts before. He was also the one who took my phone to wave in the air when the concert host told everyone to do so. He was awesome. 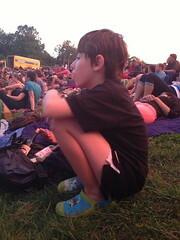 I predict rock concert fandom in his future. The show didn’t end until 11 pm, so I think my kids deserve even extra kudos for doing so well so long after their bedtimes. On the way out, Quinn started to get whiny and tried to tell me he’d hated the show, but I just told him that he did a great job, I knew he was tired and he just had to make it to the car, and he didn’t have to talk. I was hoping to stop the complaints before he convinced himself that he’d had a bad time. And I did. Today he told Alex that he loved the show. Which is awesome. Because Quinn hates everything. The other two told Alex the same thing. SCORE ONE FOR STIMEY AND HER AWESOME KIDS!! I would never in a million years have imagined our evening to be as perfect as it was. My kids and I have a lot of really fun times and times that are a challenge but are always worth it. This one was more than that. It was something special. It was a Moment. Sometimes magic happens. I’m so happy that we put ourselves out there to look for it.